Last week we shared a post on outlining and creating a digital strategy for your business. This week we are going to dive head first into the world of Search Engine Optimization so that you can improve your search engine ranking results on Google, Yahoo, and Bing. You may be thinking that SEO is above and beyond your technical chops. Surprisingly, there are quite a few things that you can do to improve your search engine ranking and they should be the foundation of any solid SEO strategy. Many people have their own idea of what SEO is or should be, but fortunately the search engines like google are the final authority on a sites content, relevance and ranking. Gone are the days of keyword stuffing, hidden text, etc. Today those techniques will get you blacklisted and possibly banned from search engines. Google says that you should focus on developing great content for your customers and audience instead of trying to build a site that Search Engines favor. Content and your customer are king. Unfortunately, as an SEO specialist, I know that is only a half truth. Site structure, content, and organization are all part of the SEO picture. Let’s take a look at some of the things that you as a small business owner can do to improve your search engine ranking. Search online for reputable local business website directories and review sites. There are tons so be careful not submit to the low quality spam sites. A quick google can help you figure which sites to stay away from. Your goal is to list your local business info: phone, address, industry, website, hours, reviews, etc. A few examples of quality local directory and review sites are yellowpages.com, yelp.com, Google My Business, etc. Start 5-6 and then continue adding to your list as you discover additional online directories. Speak to your digital marketing team for additional suggestions. A blog increases the relevancy, quality and content of your website. A great blog is educational, shares relevant content, and positions you (the business owner) as an expert in your field. By having a blog, you increase web traffic because your audience and customers are searching for products and services you offer. Think of your blog as a way to educate people on your goods and services. When done properly your blog posts will often show up in search engine results and drive traffic to your site. Google also factors in periodic fresh content additions and modifications when ranking websites. Blog consistently and commit to a set frequency. I suggest writing two blogs per months to keep things fresh. To maximize your distribution post quick snippets on your appropriate social media pages with a link back to your website blog post. Positive Reviews on your website and review sites like yelp provide a strong signal of trust and credibility to search engines. It’s important to note that online reviews require active management and responses to stay connected with your customers concerns. See the image above for local search results. 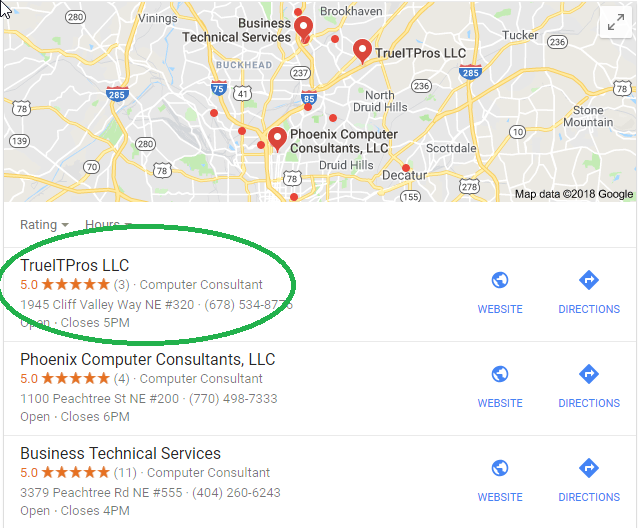 Google Reviews are a ranking factor in determining local search results and the business that will occupy this valuable real estate. Here are instructions for creating Google customer review link for your email signature. Just remember that Google does not permit businesses to solicit reviews through incentives and other offers. Beginning this year, Google began prioritizing the mobile version of a website over the the desktop version when crawling the web. In doing so, they also rank your site based on its mobile indexed version. Statistically, more users are searching now from mobile devices than their home desktop computers. As a result, all things equal, a site optimized for mobile devices will rank higher than a site that is poorly optimized. If you want your website to be a safe and secure place for visitors to browse, converting to SSL is essential. Doing so will also increase consumer confidence when browsing your site. SSL encrypts the information transmitted between your browser and web servers. In July of 2015, google began down ranking sites without SSL installed. Do business a favor and purchase SSL for your customers and get the benefit of higher Search Engine Ranking Results. Call or email your IT Support Team to get started today! Hopefully this article will help you on the way to improving your small business online presence. SEO is the foundation of any strong Search Engine Marketing plan. In the next article we will discuss how you can use Search Engine Marketing (Pay Per Click) on even a small budget to attract leads, customers and improve your bottom line.